A collaborative study into building height, density and design for the City of Cairns has been recognised for its significant contribution to urban excellence. Claiming the title of Australia’s ‘Best Planning Ideas – Small Project’ at the recent Planning Institute Australia’s (PIA) National Awards for Planning Excellence, Tropical Urbanism: Cairns City Image Study aims to ensure that any future urban growth reflects the unique, tropical character of the region. The study took home the ‘Best Planning Ideas – Small Project’ and ‘Exceptional Planning Achievement Award’ at the Queensland PIA awards in November last year. The project was a collaborative planning exercise undertaken by Council Regional Council and local architects including Tract Consultants, Follent, Peddle Thorp, CA Architects and Total Project Group Architects. Cairns, a city in tropical Far North Queensland, is framed by the World Heritage-listed Wet Tropics rainforest to the west and north, and the Coral Sea and World Heritage-listed Great Barrier Reef Marine Park to the east. The city’s population sits at over 160,000, with an average annual growth rate of 2.3 per cent over the last 10 years. A key outcome of Tropical Urbanism: Cairns City Image Study was a focus on incorporating landscaping and rainforest-like canopies into urban street frontages. “These signature design elements aim to promote tropical streetscapes that celebrate, preserve and promote our city’s much-loved character and identity,” says James. 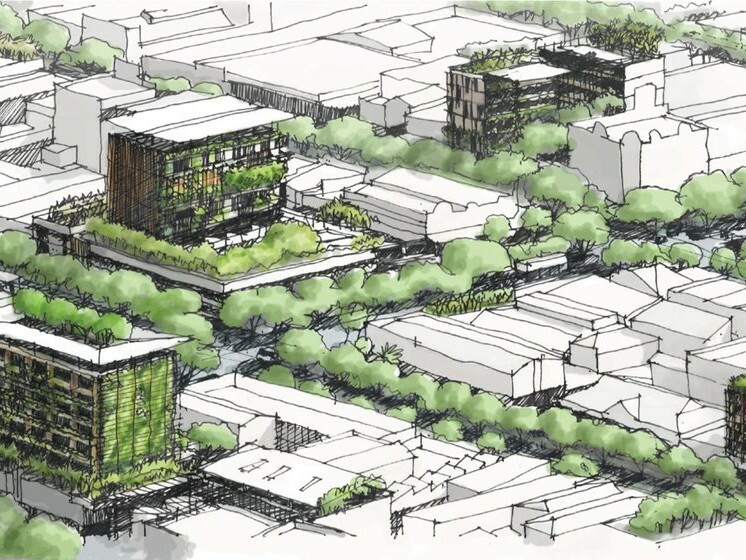 The study also reviewed the council’s planning policy on the height, density and design of buildings within the Cairns city centre. “Our proposal to increase city building heights and density – essential to cater for future population and business growth – was carefully balanced [with] the tropical urbanism elements,” says James. Tropical Urbanism: Cairns City Image Study has been integrated into the CairnsPlan 2016, a planning scheme that is setting a clear direction for future development and sustainable growth. The CairnsPlan 2016 was adopted by Cairns Regional Council on 24 February 2016 and commenced on 1 March 2016. CairnsPlan 2016’s strategic intent represents the vision for what the Cairns region will be by 2031. Intrinsic features such as natural beauty, outstanding biodiversity values and a unique tropical lifestyle are all central to this plan. As part of the plan, expected population growth in the region will be accommodated through the redevelopment of existing urban areas, and expansion into the future urban area of the Southern Growth Corridor. The plan aims for a diverse and thriving economy that complements Cairn’s environmental values. Ultimately, the built environment of Cairns going forward will reflect the region’s tropical and natural surrounds. Urban communities will be equipped with high-quality buildings, landscaped areas and open spaces that reflect the region’s intrinsic. A more in-depth look at tropical urbanism in the CairnsPlan 2016 can be found here. The full CairnsPlan 2016 document can be found here. Tropical urbanism is not just limited to Cairns though. In the last year or so, we’ve seen numerous projects in Brisbane making use of green facades. These include BVN’s biophilia-designed commercial tower at 301 Wickham Street, a 47-storey building at 443 Queen Street designed by Architectus and WOHA, and a 14-storey residential building at Kangaroo Point by Bureau Proberts that will be Australia’s first ‘vertical forest’ apartment tower. More recently are two proposed projects for Kangaroo Point – a 19-storey residential tower with a multi-layered garden façade designed by Bureau Proberts, and a 'twin tower' residential development that incorporates subtropical planting and natural ventilation designed by A+ Design Group.